September sees the twentieth anniversary of Wolves Witches & Giants. 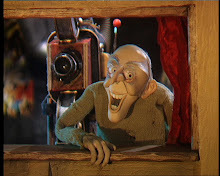 Still airing on the CITV channel, the show featured the voice of the legendary Spike Milligan. Writer and musician Ed Welch writes about his role in the series. The idea of adapting well known fairy tales that featured a baddie [a wolf, a witch, a giant] came to me when I was recording Spike Milligan in a musical setting of his masterful tale "Badjelly the Witch". 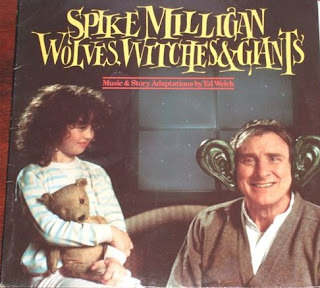 He did the cackling witch so well on that recording [in the mid 70s] that I determined to do an LP of fairy tales with musical backing [in the style of Peter and the Wolf]. I knew a record executive [Dennis Knowles] who was keen to put it out ... he wanted a double LP, so I got to work adapting the fairy tales [mainly Grimm's fairy tales] and the LP came out and did reasonably well, with a bit of TV advertising, in the early eighties. Fast forward to the early 90s when I met Simon and Sara Bor. We collaborated on a short animation on the Television Southwest hero and mascot Gus Honeybun. They came to my house for lunch and asked [as they were leaving] if I had any projects that might be good for animation. I gave them the Wolves double LP and that was that! ... We did a couple of minutes as a pilot – our choice was The Wolf and the Seven kids – and headed up to Inverness for that year's Cartoon Forum. There we played it to a roomful of TV execs and before you could say Loch Ness Monster we had been commissioned to do a series for ITV.